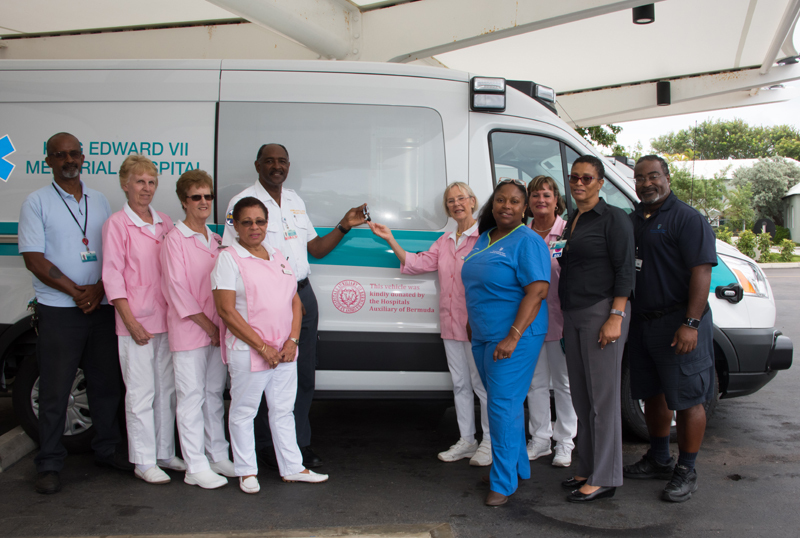 The Hospitals Auxiliary of Bermuda [HAB] has donated two new ambulances costing $197,600 to the Bermuda Hospitals Board [BHB], which brings the total number of BHB ambulances to seven. “The two new vehicles are slightly larger than BHB’s previous models. They are both Ford Transit type 2 ambulances and were made in the US,” BHB said. 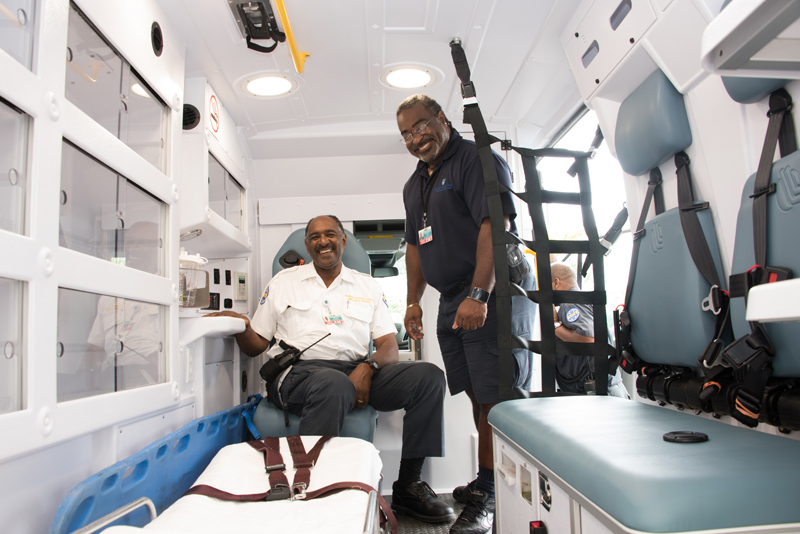 “While all the features of the BHB ambulances currently in use have been retained, they have been configured differently in the new vehicles. 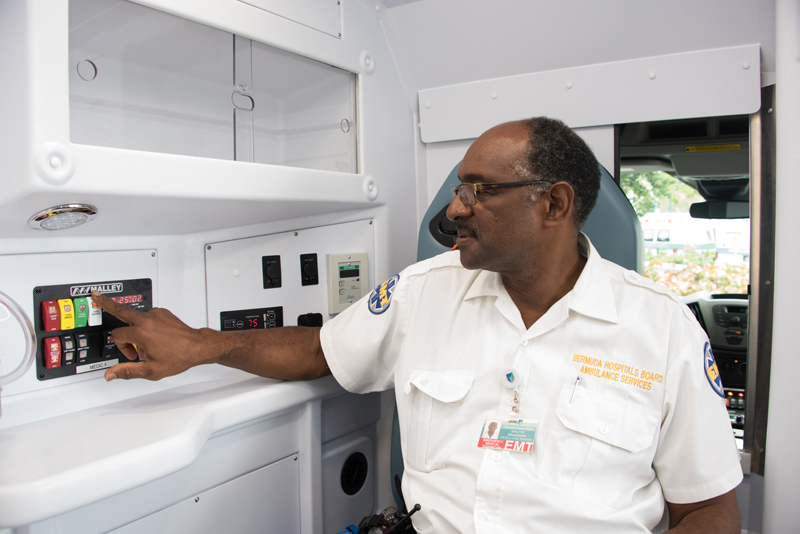 The new vehicles have a larger working area in the patient cabin section. HAB President Sharon Vesey, HAB 1st Vice President Jill Moniz, HAB 2nd Vice President Davida Simons, HAB Treasurer Angela Kendall and HAB General Manager Nancy Oughton, BHB Director of Emergency Services Dr. Roslyn Bascombe-Adams, BHB Chief EMT Walter Brangman, BHB Clinical Director Critical Care Services Lynnette Bean, BHB Engineering Services Supervisor David Foley and BHB EMT-1 Quincey Jones. “We have needed new ambulances for some time and are grateful to the HAB for this generous gift,” said BHB CEO Venetta Symonds. “I applaud their efforts on behalf of BHB and also on behalf of the entire Bermuda community. “The HAB is proud to be able to serve our community by providing funding for lifesaving equipment for our only hospitals,” said HAB President Sharon Vesey. The HAB raises funds for BHB through their three business enterprises, The Barn, The Pink Cafe and The Gift Shop. They also receive donations and annual membership dues from their members. HAB volunteers work throughout many areas in the hospital, including information desk, CCU, hospitality cart, lending library, assisting patients with their menu selections on the wards, Fracture Clinic, Pharmacy and chapel services, as well as assisting overseas patients and their families. In addition to their adult volunteers, there are also 99 junior members of the HAB, known as candy stripers. These students enter the programme at age 14 and commit to a minimum of two years, with the majority remaining in the programme for four years. These students are trained in all areas that the adults work in, as well as additional areas in the hospital such as Dialysis, Lab, Gosling, Maternity, Environmental Services, Surgical Admin, Laundry, ICU and Sterile Processing. The students work every school holiday and give the adults a welcome relief. On average 36,500 hours of service are donated to the hospital every year by HAB adult and junior members. Absolutely Wonderful!!! Just incase we need multiple Ambulances at one time Lord forbid we will have to but just incase. A Ford Transit once did a lap around “The Ring” in almost 10 minutes flat. What a great gift from the Pink Ladies, Candystripers and volunteers at The Barn! Your community volunteer service is so much appreciated.